Today, we’re happy to announce that the Relevance Cloud is out of beta and available to all with the 15.02 release. This release introduces Build (API-based personalization building blocks) and delivers enhancements to our Recommend and Discover products, helping you to personalize every step of your customers’ purchase journey and setting you up for an exciting 2015! Let’s start with Build. Build is an entirely new approach to personalization that uses the power of cloud APIs to give you real-time access to the building blocks of personalization: customer data, product data and contextual events. Not only are these APIs the foundation on which we have built our own applications, they also power some of the most innovative customer experiences for top retailers such as Marks and Spencers. Watch the webinar on how to reshape your CX using Build or download this white paper to learn more. Gain full view of the customer in real time through Profiles API. Track every click, view, search and purchase as they happen through the Event Stream API. Record your consumers’ likes and dislikes explicitly with the preference API. Turn on product or search and browse personalization on any channel: web, mobile or store. Preview “complete the look” or “compatible products” for Advanced Merchandising rules before deploying them. Improve testing for coat-tailing rules with Discover. 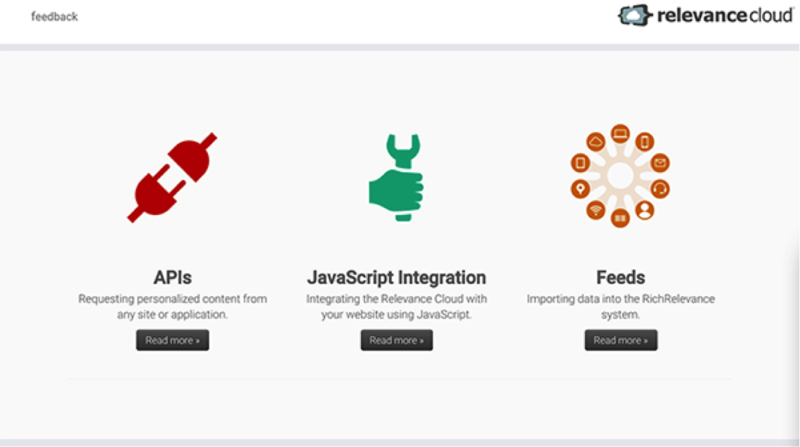 Log in to your RichRelevance dashboard to read more details in the release notes. Developers know that it can be extremely frustrating to access complete and up-to-date documentation. It slows down the process of trying to figure out how to work on all the new, exciting features. However Jen Kollmer, our product documentation champ, has got you covered. Jen has single-handedly created a site dedicated to enhancing our developer experience, so that you can focus on innovating your customer experience. Check it out at: http://developer.richrelevance.com. Comment here on the blog if you would like to thank Jen or give her any ideas for improvement. Along with the Relevance Cloud release, we’ve made some critical changes to our dashboard so that features and functions are better organized around tasks, and you have a more streamlined and productive experience. Finally, if you find it to be more productive, you can even customize our dashboard in Japanese! Check out the full list of changes on our dashboard. If you have questions, feel free to reach out to support@richrelevance.com.